Virginia Maria Romero is one of a handful of “Anglos” to be counted among the santero artists of the American Southwest with works in numerous national and international private and museum collections. A biographical sketch that recognizes Romero as an important New Mexico artist is included on the New Mexico Office of the State Historian website: www.newmexicohistory.org - under People, Culture, Artists, and Visual & Performing Arts. In 2013 Romero was recognized as a distinguished Artist and Poet by the American Council for Polish Culture. Romero is an award winning artist whose works reflect original contemporary designs that express the distinctive voice of their creator. 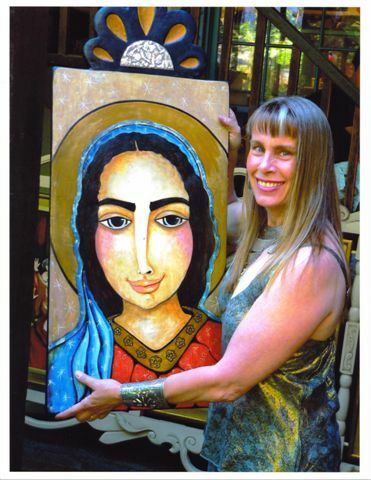 Romero’s artwork has been selected for collections that include: Millicent Rogers Museum, Taos, NM; El Museo Cultural de Santa Fe, Santa Fe, NM; New Mexico Farm & Ranch Heritage Museum, Las Cruces, NM; The Friars of the Sick Poor of Los Angeles, Los Angeles, CA; San Miguel Mission, Santa Fe, NM; Basilica of San Albino, Mesilla, NM; Pope Benedict XVI, and Cardinal Levada, Vatican City, Rome; Maria Stein Heritage Museum/National Marian Shrine of the Holy Relics, Maria Stein, OH; Our Lady of Guadalupe Shrine and Parish, Mesilla Park, NM; Holy Cross Retreat, Las Cruces, NM; St. Francis Jerome Church, Center, CO; Santa Francesca Romana, Rome; Basilica di San Miniato al Monte, Florence, Italy; Monte Olivito Maggiore; Virgin Galactic; New Mexico Centennial Commemorative artist, Santa Fe, NM.